Bond mutual funds can be attractive to short term investors. One of this bond funds is government bond fund. This type of fund typically is very safe and has investment grade credit rating. These bond funds typically invest majority of assets in US Treasuries. These funds can be short term, intermediate term, and long term bonds. One of these government bond funds are described below. Note: Long term bond fund which has longer duration years may be susceptible to interest rate hikes. The American Century Zero Coupon fund’s objective is to seek the highest return consistent with investment in U.S. Treasury securities. 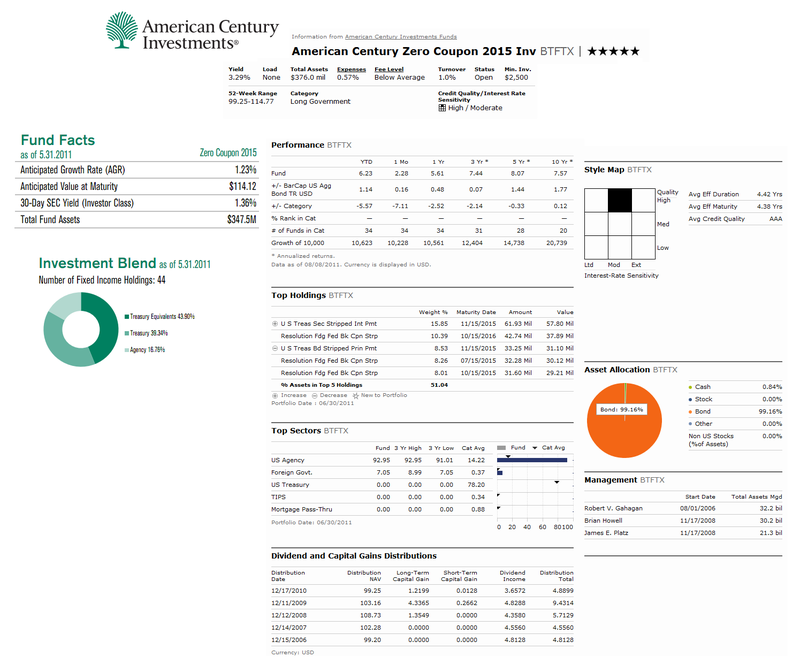 This American Century fund invests >80% of assets in zero-coupon U.S. Treasury securities. This bond fund may invest <20% of assets in AAA-rated zero-coupon U.S. government agency securities. Zero-coupon securities make no periodic interest or principal payments. The fund is managed to mature in the year 2015 and will be liquidated near the end of its target maturity year. This American Century bond fund has been managed by Robert Gahagan since August 2006. The fund was introduced to public in September 1986. This top long government bond fund also has a 3.35% yield. The expense ratio is 0.57% per year. To invest in this fund, investor will need $2,500 for the initial investment and $50 for the minimum subsequent investment for the brokerage account. No retirement (IRA) account is available at this fund. This is a no load fund, this means it has no front-end sales load fee. It also doesn’t have a 12b1 fee. Morningstar has given 5-star rating for this BTFTX fund. It is also listed as one of the best long government bond fund by US News. It has recorded 18 years in positive return (best was achieved in year 2000 with 26.59%) and 6 years of negative return (worst in year 1999 with -14.56%). Currently it has 2.97% YTD return. This best bond fund has returned 4.25% over the past year and 8.01% over the past five years. The three-year beta of this fund is 1.55. This fund can be purchased from 97 brokerages like JP Morgan, Merrill Lynch, T Rowe Price, LPL SAM Eligible, TD Ameritrade, E Trade Financial, Dreyfus NTF, Ameritras NTF N, Schwab Retail, Pershing Fund Center, Scottrade NTF, TIAA-CREF Brokerage Services, etc. The other clas of this fund is ACTTX (Advisor Class). 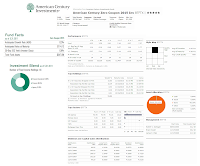 As of May 2011, this American Century fund has a total of 44 fixed income holdings. The investment blend is Treasury Equivalents (43.90%), Treasury (39.34%) and Agency (16.76%). As of June 2011, the top sectors of this fund are US Agency (92.95%) and Foreign Government (7.05%). The fund's effective duration is 4.42 years and the fund's effective maturity is 4.38 years. This investment fund has risks such as Interest rate risk, Unanticipated capital gains or losses, Zero-Coupon US Treasury Correlation, Principal Loss, etc. Details can be found in the fund’s prospectus.